As a mother and a kindergarten teacher, my heart goes out to everyone affected by today’s tragedy in Connecticut. I remember hearing about the Columbine school shooting when my own children were one and four years old and how it shook me to my core. Now a new generation of parents has to grapple with unanswerable “why” questions and concerns about their children’s safety. You just want to hold them tight and keep them safe. I recall driving my oldest child home from the hospital 24 hours after she was born. Passing through a crime-ridden section of Albany in the darkness, her newborn life seemed so fragile. Those first days of her life, I kept thinking about how she was going to have to share the world with so many hurting people who, as a result of their own pain, would be capable of hurting her. Protecting her from harm had become my new life’s purpose. Children are especially on my mind this evening. I can’t imagine what it must be like to be a child and to hear about innocent children “just like me” being killed so senselessly at school. Every single day, I use the language of safety in my classroom, reminding my kindergartners that my number one job is to keep them safe, and that the various rules they are expected to follow are there for their physical and emotional safety. School is supposed to be a place of safety. For children with challenging home situations, school is a place of consistent, comforting rhythms and routines, an atmosphere of caring. I hope families – parents, older siblings, extended relatives – will be mindful of how and to what extent their children are exposed to news about the Connecticut school massacre. Some families will be vigilant in limiting their children’s exposure to the news. Others may have the news on in the background and assume the children aren’t paying attention. Still others may communicate more or less openly with their children about what transpired. Even when families are vigilant, we can’t control what young children may overhear on the bus or from older siblings. Here is what I wish, most of all, for children to know about tragedies such as this one: Yes, something happened that was very wrong. However, there is more light than darkness in this world. People are capable of fantastic, wondrous things. May we do everything in our power to nourish the gardens of our children’s hearts and minds with the sunlight of kindness, the pure water of beauty, and the warmth of goodness, and be vigilant in tending to the weeds of fear and sadness as they arise. May we teach them through our example and loving presence to be kind and resilient and to do good work in this world each day. May we expose them to positive role models – the helpers of this world who rarely make front page news but go quietly about the business of filling our world with light, hope, and love. May we bring children’s attention to the goodness that exists in this world and surround them with opportunities for developing kindness, compassion, and caring. May we guide them to feel safe and secure, knowing that many people are looking out for them and safeguarding their well-being and that there is much more good than evil in the world. I also envision a world in which people who need help have easy, affordable access to appropriate, effective health care. As a parent, one of my favorite memories is of reading truly beautiful books with my children at bedtime. As a teacher, the moments I feel most in-the-flow are when I am sharing wonderful literature with my students. I was like a kid in a candy store when I worked as a shelver at our local public library and was able to discover so many unknown treasures. 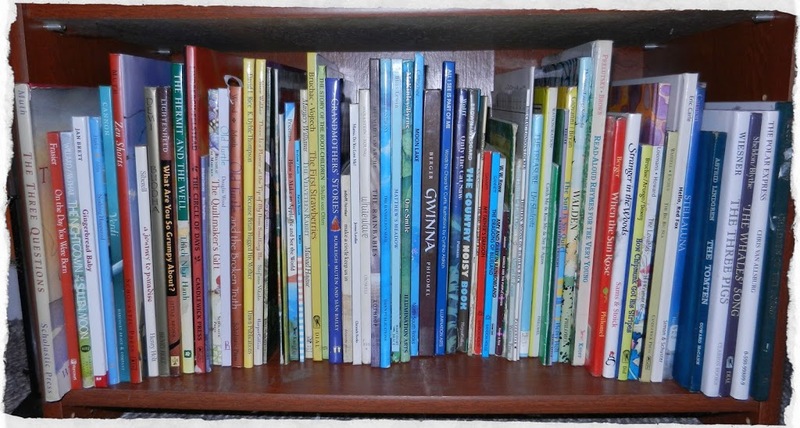 I love books and have a passion for children’s literature – picture books, in particular. There is something incredibly compelling about the pairing of beautiful art with an inspired story. I love how certain children’s picture books can express such depth in the space of only 30 or so pages with limited text. My original list was twice as long, but it seemed too overwhelming with so many choices, so I forced myself to narrow it down. I asked my teenagers what books they remember most fondly from their childhoods. For my daughter, it was Grandmothers’ Stories retold by Burleigh Muten. Blueberries for Sal by Robert McCloskey and Grandfather Twilight by Barbara Berger were the ones my son remembered. However, I also recall all the times I read The Country Noisy Book when he was little, and I remember him laughing like I’d never heard him laugh before as we read David Wiesner’s version of The Three Pigs. I also remember how much my daughter loved the rhymes in Catch Me and Kiss Me and Say It Again by Clyde Watson when she became a big sister, and snuggling with her for repeated readings of Mama, Do You Love Me? by Barbara M. Joosse, The Big, Big Sea by Martin Waddell, and The Tomten adapted by Astrid Lindgren. So many wonderful books. So many wonderful memories of time well spent with my children! This year, I have spent much time observing the Eastern Cottonwood trees on the riverside and have fallen in love with them. They have amazing energy and a fascinating life cycle, and I want to share their story with you. 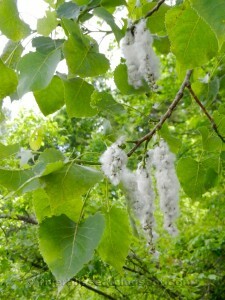 Recently, I learned that cottonwood trees are sacred to the Lakota people and are central to the Lakota Sundance ceremonies. 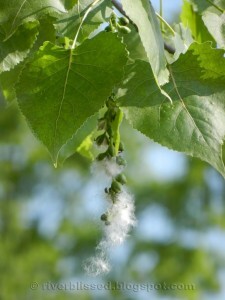 I experience cottonwood energy as quite powerful and therefore was not at all surprised to learn of the cottonwood’s significance to the Lakota. Spring came early this year, and I was able to start kayaking in March, which was unprecedented. I took a lot of photos of trees along the shore, to share images of tree life cycles with my students on our SMART Board. 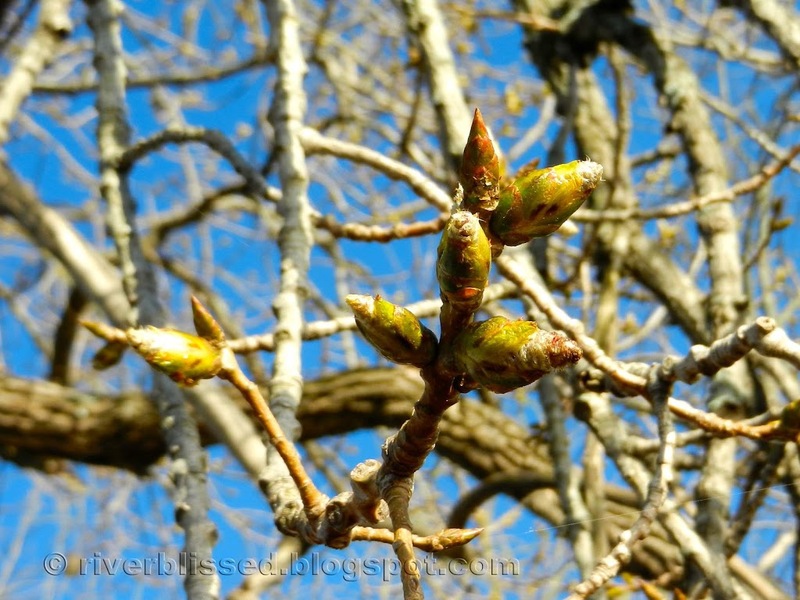 Actually, I was quite blown away by noticing that leaves in spring begin with colors quite similar to the colors of autumn. (How can it be that it took nearly half a century for me to notice or remember this?) 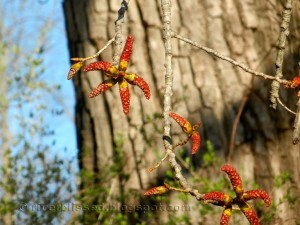 I photographed maple, oak, and willow trees and a mystery tree that took a while to identify. 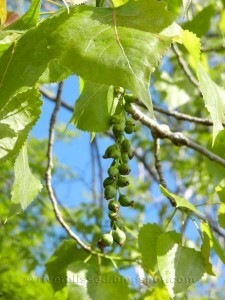 The mystery tree turned out to be an Eastern Cottonwood. When I showed my kindergartners the photo below, they loved the “starfish” and began calling it the “Patrick tree,” after a starfish character in the SpongeBob cartoon. After seeing this picture, they made a habit of asking if I had more pictures of the Patrick tree. Naming the tree was a very important development, which came entirely from the children. Once the tree had a name, it seemed to come alive and become interesting to them. Even I began to think of Patrick as a personality and wanted to learn more about him. I still didn’t know what kind of tree Patrick was but continued to photograph his changes. 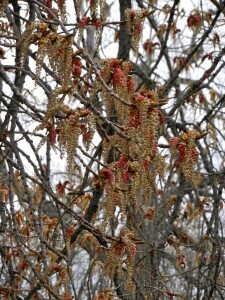 Next, the catkins developed – drooping strands of tiny flowers. 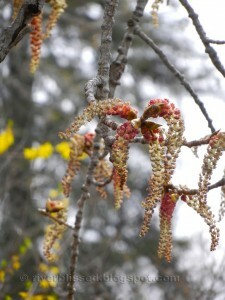 Eventually, tiny leaves came out and began to unroll. 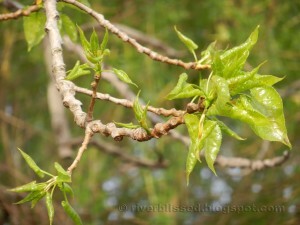 The leaves continued to grow, appearing shiny and waxy at first. At this point, I had become downright intrigued with the “Patrick” tree, did some research, and was able to identify him as a cottonwood. The next day, I went to school, excited to tell the children that I learned Patrick’s last name. He has been “Patrick Cottonwood” ever since, and I just love that name! 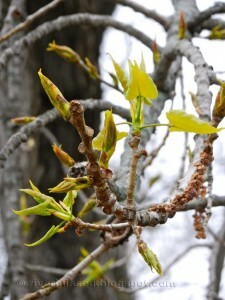 Patrick Cottonwood’s leaves continued to grow in size and deepen in color, losing their waxy sheen. 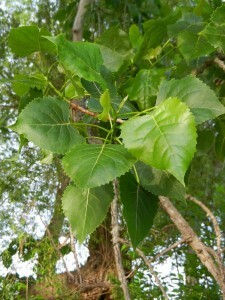 I have read in multiple sources that one of the reasons why the cottonwood tree is considered sacred is because its leaves provided a pattern for the tipi. 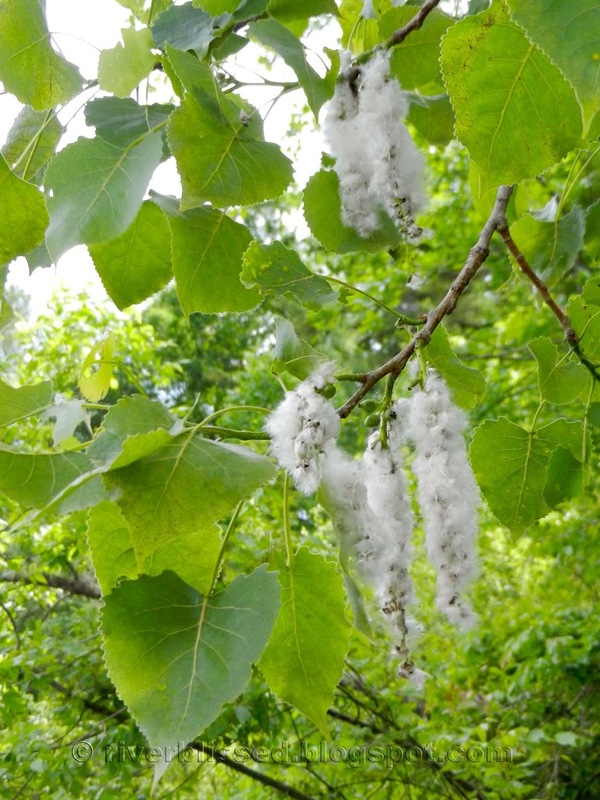 According to The Cottonwood Tree: An American Champion by Kathleen Cain, Lakota (Sioux) holy man, Black Elk, explained that children began making little play houses from cottonwood leaves, which inspired the elders to construct tipis. 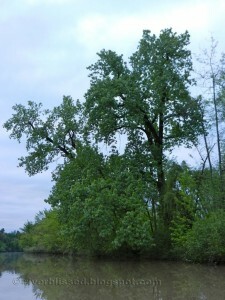 In addition, if an upper branch of a cottonwood tree is cut, the cross-section reveals a five-pointed star (which seems to explain the five-pointed starfish pattern of the buds). I explained to the children that Fluffy was Patrick’s girlfriend, and he sent gifts (pollen) to her through the wind, and then she would reciprocate by becoming cottony and releasing cottony seed fairy babies into the air when the little fruits opened. Patrick and Fluffy love to give each other gifts! Here (below) is Patrick, living peacefully on the riverside. 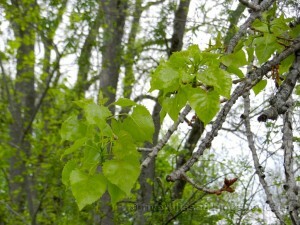 Cottonwoods are similar to aspens in that their leaves quiver and rustle in the wind. 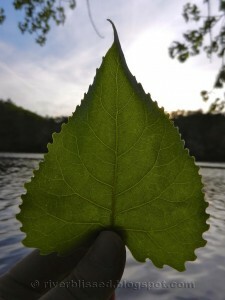 When I approach Patrick Cottonwood by kayak, he is an endearing sight because it looks like his heart-shaped leaves are waving hello and beckoning me to pay him a visit – which I do. I rest for a while beneath his canopy of leaves. This is one of my peaceful places where I bring my questions and often find answers. Patrick teaches me a great deal about patience. Patrick looks pretty much the same throughout the summer. But now, on the first day of autumn, his leaves have begun to turn gold, much like human hair turns gray with age and wisdom. 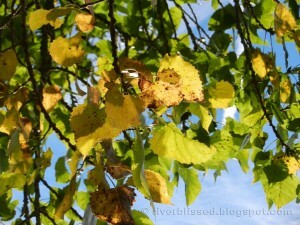 Soon he will be completely golden and then will release his leaves throughout October until a late October breeze comes along and leaves him bare. And then he will take a long nap. When he awakens, the fascinating process will begin again – one big circle that includes a time for rest. As I watched what seemed like millions of cottonwood seeds floating on the river back in late spring, I wondered where the new generation of cottonwoods would make their home. Only time will tell. Ever since I began teaching kindergarten, my husband and I have made a tradition of searching milkweed plants for monarch caterpillars over Labor Day weekend, right before the school year starts. The goal is to collect a few caterpillars so my students can observe the dramatic and colorful transformation from caterpillar to butterfly; however, it is an activity we truly enjoy doing together each year. My husband has fond memories of his mother packing him a picnic lunch before he headed out to look for monarch caterpillars as a child, and he cherishes the opportunity to continue this tradition with me. Observing the monarch life cycle is a magical way to begin kindergarten and a powerful reminder of the potential for transformation and transcendence. There are so many metaphors to be found in the monarch life cycle, and it is interesting to notice which ones resonate most strongly each year. Monarch butterflies lay their eggs on milkweed leaves, and when the caterpillars hatch they begin eating the leaves, which is their entire diet. During August, we note the locations of the most promising milkweed patches. Some years, despite a great deal of effort, we come up empty handed. Last year was such a year. We didn’t find any monarch caterpillars but returned home with a great story. After combing all of the known milkweed patches, we expanded our search along the country roads near our home and noticed an impressive field of milkweed across the street from a farmhouse. Feeling both desperate and adventurous, we decided to knock on the door and ask permission to look for monarch caterpillars in the field. The old man who came to the door obliged our request; however, the grass was so tall that we gave up soon after beginning. On our way back to the car, the man came back outside to ask us if we had any luck, and we ended up having a lovely heart-to-heart conversation with him about life in this day and age. I wish we could have filmed him talking. He was a retired dairy farmer and spoke about how much better farming is in Canada because farmers get paid better and can afford to maintain their property and equipment, which is not the case here. He really opened up to us and talked about his perception that too much damage has been done to this country by greed, and said he is not sure we can fix it at this point. It was such a joy to interact with this kindhearted man and to hear an old farmer share his wisdom. A couple times during the conversation, I actually found myself choking back tears because I felt my grandmother’s spirit coming through him quite powerfully. (Her urn is decorated with a pastoral farm scene, paying tribute to her Vermont roots and her love of Vermont farm life, which was an important chapter of her life.) Without ever mentioning this to my husband, as we were driving home he remarked that he felt my grandmother’s presence during that conversation. That is one caterpillar mission I always will remember. This year, however, we saw several monarch caterpillars and butterflies the week prior to Labor Day and knew we would be successful in fulfilling our goal of collecting caterpillars. Sure enough, when it was time, we ended up collecting seven caterpillars. We begin by looking for tender, green milkweed leaves that have some holes eaten through them. We also look for droppings. Often, the caterpillars munch on the underside of milkweed leaves and thus are cleverly hidden, so we need to look for clues suggesting their presence. We squat down low to the ground to see the underside of the leaves. This year, we found three large, plump caterpillars that looked like they were nearly ready to turn into chrysalises and were likely to do so before school started. We also collected four very small caterpillars so the children would be able to observe the active larva (caterpillar) stage. We put the caterpillars and some milkweed into a butterfly tent with mesh sides and a transparent top that zips open. The very hungry caterpillars munch their way through leaves until they have had their fill and somehow know it is time to enter the next stage of their life cycle. I am amazed and inspired by this part of the process and how the caterpillars know when it is time to change. I wonder how often the human capacity to think suppresses an inner knowing that it is time for us to change. How often do we convince ourselves to resist doing something different that would result in living a more authentic life because we are so used to a particular way of being – and it feels too risky to do otherwise? Each in his or her own time, the caterpillars climb up the walls of the tent to the top, and eventually begin making a silk button from which to hang. The caterpillar hangs in a “J” shape for a large portion of a day before turning into an emerald-jade green chrysalis by molting its skin. The skin, which has become too tight, begins to split around the bend of the “J,” and the caterpillar wraps itself into a chrysalis. It wiggles and jiggles its way into the chrysalis stage. The monarch chrysalis is an elegant sight – an emerald green case embellished with numerous, patterned golden dots, like a jeweled crown. 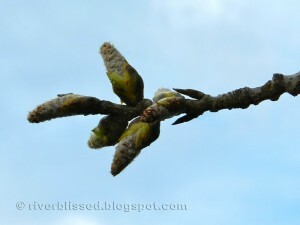 For about ten days, the green chrysalises hang, quiet and still. The children check the butterfly tent every day when they enter the classroom to see if a butterfly has appeared. Throughout the week, the chrysalis fades gradually in color until it becomes transparent, like a window. Although this is the time when the least activity appears to be taking place, it is a powerful time of metamorphosis. 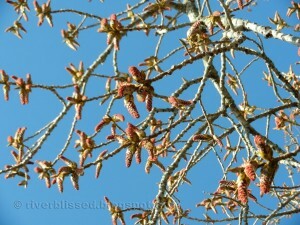 It reminds me of the human potential for great transformation to take place during periods of stillness. In time, the chrysalis splits open, and the butterfly emerges. This was just beginning to happen when I entered my classroom this morning, and I grabbed my camera quickly! The butterfly lowers itself out of the pupal case, extends its legs, and clings to the pupal case. The abdomen is swollen with fluid that needs to be pumped into the tiny wings to help them expand. Eventually, the wing tips will fill with fluid. And then the butterfly will wait for its wings to stiffen and dry. After several hours, the adult butterfly will be ready to fly. The monarch butterflies born in our area at this time of year will migrate to Florida, Eastern Texas, or Mexico and gather on trees that are literally covered with monarch butterflies. It is amazing to think that such small, delicate wings will carry them thousands of miles on a rigorous journey and that each butterfly somehow is able to find his or her way! When it is time to release a butterfly from our butterfly tent, I gather the children on the playground outside our classroom and let the butterfly perch on their fingers if it is not in too much of a hurry to try out its wings for the first time. The expressions of wonder and joy on the children’s faces are priceless, as is the gentleness with which they pass the butterfly along to the next classmate and the sincerity and hope with which they wave and exclaim, “Fly, butterfly, fly!” This is an authentic learning experience that leaves an impression on the soul that no assessment tool could ever measure. It is a truly magical way to begin the year, and I continue to be inspired and fascinated by the process every year.